According to the National Spinal Cord Injury Statistical Center in Birmingham, Alabama, about 12,000 Americans per year suffer spinal cord injury. It can be caused by trauma, such as a fall, a car accident, or a sports injury—or it could be the result of a severe infection, a tumor, or other nontraumatic medical issues. More than half of all spinal cord injuries are to the neck area (cervical spine), although some affect the patient’s chest region (thoracic spine) or lower back (lumbar and sacral spine). As a result of spinal cord injuries, patients may lose sensation or muscle function. Their autonomic functions can be affected, causing them to experience problems such as low heart rate or low blood pressure. They could even have a hard time regulating their body temperature. Their breathing and digestion may also be adversely impacted. If the injury is so severe that it causes a loss of all signals through the spinal cord, it is considered a “complete” injury. In other cases, patients lose some nerve signals due to spinal cord injury, but not all of them. This is known as an “incomplete” spinal cord injury. Whether complete or incomplete, spinal cord injuries can cause numbness, incontinence, and breathing problems. For example, a patient with an injury to the lower cervical vertebrae (C5 to C8) may have difficulty coughing or clearing their throat. In a complete cervical spinal cord injury in the C1 to C4 area, the patient might need a ventilator just to breathe. Depending on the location and severity of a spinal cord injury, patients may become temporarily or permanently paralyzed, either in both the upper and lower limbs (quadriplegia, also called tetraplegia), or only in the lower limbs (paraplegia). Paralysis brings special care concerns. For instance, paralytic patients may suffer pressure sores and their muscles may atrophy. Even without paralysis, spinal cord injury patients might endure water on the lungs (pulmonary edema). Poor nerve signaling can cause neuropathic pain. The majority of spinal cord injury sufferers deal with involuntary muscle tensing (spasticity), causing their muscles to feel stiff or tight. The qualified nursing staff at Assured & Associates is trained to help spinal cord injury patients work through issues like spasticity by perform range-of-motion exercises with them several times a day. Physical therapy can also reduce the risk of muscle atrophy and help prevent weakness (demineralization) in the patient’s bones. The home care staff at Assured & Associates can administer blood thinners (as prescribed by the patient’s physician), systematically move the patient’s limbs, and use compression garments or pressure hoses to keep fluid from accumulating and causing deep vein thrombosis (DVT). Spinal cord injury has far-reaching effects that necessitate daily care by highly-trained medical professionals. For patients in Atlanta and Alpharetta in Fulton County, Assured & Associates’ staff of Registered Nurses (RNs), Licensed Practical Nurses (LPNs), and Certified Nursing Assistants (CNAs) can provide physical therapy, administer medication and respiratory care, and perform other vital services that spinal cord injury patients need to maintain their quality of life. 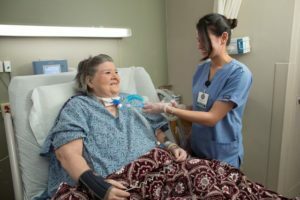 We’re there for patients in neighboring DeKalb County; in Douglasville, Georgia in Douglas County; and Marietta, Georgia, in Cobb County. If you or a loved one need ongoing care for a spinal cord injury, turn to the medical expertise and caring touch of Assured & Associates.